Patrick and Linda met in Waterman, IL in 1977. They married September 1, 1979. Patrick got his start working at a steel factory, and Linda was a hairdresser who stayed home to raise the kids. When the steel factory was outsourced, Patrick worked at an auto dealership in Sandwich, IL selling cars, and quickly rose through the ranks to become General Manager. Patrick would work 80 hours per week, but he didn’t see his family much. In 1999, his parents moved to Florida, which made it a destination for family vacations. After a great trip, their son asked when they were moving to Florida? Patrick and Linda discussed it and took a leap of faith, moving to Ocala in August 2000. They opened up two All Tune & Lube locations here in Ocala, but after Linda developed (and beat) cancer in 2003, they decided to keep only one shop location. Patrick and Linda love being part of the Ocala community, and nothing pleases them more than seeing their customers stop by for a visit. Our team excels at solving problems. With Chuck’s 37 years of expertise leading the charge, our team of auto mechanics is super good at fixing everything that comes in. Chuck has lived and worked in the Ocala area for a long time, and he’s passionate about taking care of our customer. Plus, he loves to work on anything automotive that comes through our door. Jim has been with Pals Ocala Auto Repair for 11 years, and he is a Master ASE-Certified Technician. After 30 years of experience, there’s nothing Jim can’t fix. We knew from the beginning that Jim’s a mechanical mastermind. He can perform regular automotive repairs, as well as obscure things, like an electric clock on a classic Buick. From transmission service to complex engine repairs, Jim’s an auto mechanic you can trust to do it right. Lester Harwood is the newest addition to the PALS Ocala Auto Repair team. He moved from Colorado to Florida in 1976. He's had his ASE Master Certification for over 30 years, and has been working on cars since he was 15 years old. He is proving to be a great asset to our "family". Shelly is Chuck's wife and the friendly face you will see at the front counter, upon entering the shop. We are thrilled to have her in the shop, helping our customers. Originally from Missouri, she decided to move to Florida in 2012 and married Chuck in 2015. Her life experience includes working as a nurse, with some prior experience in the auto industry as well. Interestingly, she is also a retired barrel racer, known as "Shotgun Shelly". Originally from Texas, Ivan moved to Central Florida in 2013 to earn his Associate of Science Degree in Automotive Technology. After graduating, he was hired by larger corporate stores in the automotive industry. 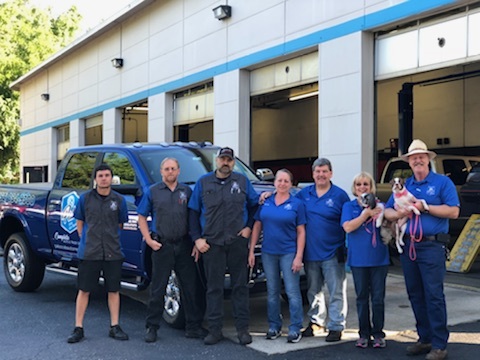 But he decided to join Pals Ocala Auto Repair in 2018 because he likes the friendly, family vibe and the fact that we do Saturday customer cook-outs with deliciously free burgers. Ivan’s first car was a 1999 Dodge Avenger and as a result, his favorite cars to work on are the Dodge Ram 1500 and the Honda Civic. His favorite type of auto repair challenge is the electrical repair aspect. Electrical repair is not easy, because it’s more than just a wiring diagram. Instead, electrical repair is all linked to the vehicle computers, and when Ivan can solve those tough challenges, he knows it’s a job well done. Collectively, our team takes their training and continuing education very seriously. They each go to auto repair school every two months after work for two nights, getting 8 hours of credit through the TechNet program with Advance Auto. We are proud to have such smart guys here at Pals Ocala Auto Repair! In fact, if you count up the combined years of experience our auto mechanics have, we have over 100 years of experience altogether. We invite you to find out for yourself what makes Pals Ocala Auto Repair so special. We strive to create the best possible customer service experience because we want you to choose our auto repair shop every time your vehicles need service. If you have questions, we invite you to give us a call or schedule an appointment. Pals Ocala Auto Repair is conveniently located off I-75, and is next door to the College of Central Florida. Find us at 2821 SW College Road, Ocala, FL 34474. We look forward to seeing you soon!